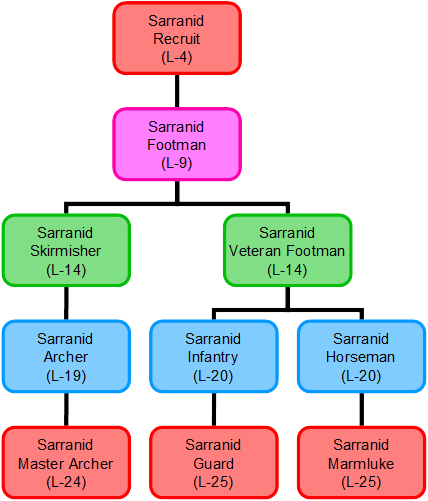 The Sarranids are a new faction introduced in Warband. Their troop tree is very similar to Swadians and Vaegirs, but their equipment is different. Usually Sarranid units are less armored but much faster than their Vaegir and Swadian counterparts. The Sarranids, like the Swadians and Vaegirs, are markedly adaptable with access to all three troop types. Even more so than the Vaegirs, Sarranid infantry make use of a wide variety of weapons, and can be seen wielding swords, maces, spears, picks, jarids, and two-handed axes. Sarranid Guards have the Sarranid Battle Axe, which is rare but slightly better than the Great Axe used by Nord Huscarls. However, their skills are quite poor. Sarranid infantry have a Power Strike of 0 until they reach Guard, even then having a Power Strike of only 3, the lowest of any top-tier infantry. Sarranid infantry also have a lower Shield skill than any other infantry except the Vaegirs and are tied with the Vaegirs for lowest Ironflesh, and their light Sarranid Guard Armor provides the least protection of any top-tier infantry unit's armor, meaning that their survivability is generally poor. Guards do have a chance of spawning with jarids as a throwing weapon, which can give them an edge while closing in. Their weapon proficiencies are good, being on par with to slightly better than the proficiencies of most other infantry besides the Nords. They also have a decent Athletics skill and because of their light equipment will move a little faster than most other infantry. Still, in most situations they are outclassed by other factions, and while playing as part of the Sarranid faction it may be best to ignore their infantry line entirely and recruit from other factions. Although they don't have horses, Sarranid Guards are tagged as mounted units and so will not slow you down on the world map. The Sarranid Master Archer is the fastest ranged attacker in the game, but is otherwise quite weak. Sarranid ranged attackers can work well in numbers where the volume of projectiles can overwhelm the enemy, and they are slightly more skilled than Nord and Swadian ranged attackers. However, even the Sarranid Master Archer makes use of the low-end Nomad Bow which does less damage than the higher-end weapons of other factions' elite ranged attackers. In addition, their Power Draw skill is slightly lower than other archers. Sarranid archers can do well in large groups, but the ranged attackers of other factions will generally be far more effective. Their most important line is their cavalry. The Sarranid Mamlukes are one of the best mounted units in the game, being the only unit comparable to the powerful Swadian Knight in overall quality. Mamlukes are fast, tough, and make quick work of other unit types. The Sarranid Mamluke and Swadian Knight are about almost equal in base skills, as is the Sarranid Horseman with the Swadian Man at Arms, so unless one of them gets a bad result from the stats randomization at the start of the game, the real difference between the two comes down to equipment. The Mamlukes uniformly wear the Mamluke Mail as body armor, while the Swadian Knights use the red Coat of Plates and the Cuir Bouilli, both of which are marginally better than the Mamluke Mail. The Sarranian War Horse used by Mamlukes and the Charger used by Swadian Knights are statistically exactly the same. Mamlukes occasionally instead ride a Sarranid Horse, which is significantly less durable than the War Horse sometimes used by Swadian Knights, but neither of these spawn often enough for it to be a decisive difference. The Elite Cavalry Shield used by Mamlukes can take a hit or two more than the Knightly Heater Shield used by Swadian Knights. Both Sarranid Mamlukes and Swadian Knights use the Heavy Lance. While Swadians are natural lancers and slightly more proficient, a couched lance blow from either is rarely survived. The Elite Scimitar is the primary weapon of Sarranid cavalry; compared to the Long Arming Sword, the one-handed weapon used by Swadian Knights, it's somewhat faster and does just one less point of damage. Mamlukes also use the Sarranid Cavalry Sword, which does less damage than the Elite Scimitar and is a little slower, and has a thrust attack less damaging than that of the Long Arming Sword. For two-handed weapons, Mamlukes have the Iron Mace while Swadian Knights have the Two Handed Sword and the Morningstar. The Iron Mace is longer than the Morningstar, and unlike the Morningstar it has a thrusting attack and can knock enemies down. The Two Handed Sword is a little better than the Iron Mace purely for its speed, reach, and damage, but this is countered by how rare it is among Swadian Knights who are more likely to spawn with a Morningstar when they use a two-handed weapon at all. Overall, it is difficult to define either of the two best heavy cavalry units as being better than the other. The Swadian Knights incur a few minor advantages, but that's far from decisive. It will be easier for most player characters to add Swadian Knights to their party because of Swadia's easily accessible position, but beyond that choosing either (or a mix of both, as Lezalit suggests) is sound. Footman then Archer - First Tree then branches off into first secondary one. This page was last edited on 5 October 2012, at 19:52.